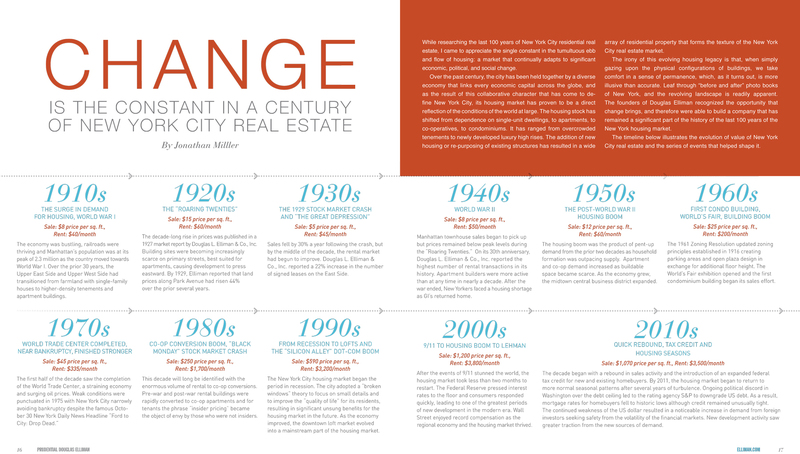 In the past century, the New York City real estate market has seen significant fluctuation. With the emergence of apartment complexes, new legislation, and financial disrepair, the market was forced to adapt to demands and challenges over time. With the dawning of World War I, there came alongside it an increased demand for housing in Manhattan. The economy was thriving as railroads were constructed and the transition from farmland to buildings meant for residence was finished in the years preceding. The Zoning Resolution of 1916 enacted restrictions on the height and bulk of buildings constructed after its adoption, thus reducing the risk of fire hazards and other endangerment of inhabitants. A surge of prosperity and the usage of credit caused an influx of expenditure and construction. The cost of rent rose 50% from the average price in the 1910s. By 1927, main streets had grown significantly scarce in available lots. Overall, there was a massive price hike due to the increased demand and dwindling resources. With the arrival of the Great Depression, the real estate industry was hit hard. Because of the decrease in available land, there was a halt in construction activity, and a sudden rise of foreclosures worsened the blow. While the stock market recovered somewhat from its crash by 1933, the real estate industry suffered throughout the decade. As World War II began, the sale of townhouses increased, though prices remained lower than they were during the 1920s boom. Multi-family buildings became a popular construction endeavor. When the war ended, there came another housing shortage with the return of veterans, and this led to the integration of rent controls. Following the war, there came a housing boom. Because of the growing population, the demand for housing increased drastically, but the space available for constructed was even more limited than ever before. As businesses grew rapidly, the destruction of some apartment complexes was the price for the construction of office buildings on Park Avenue. A new Zoning Resolution was adopted in 1961, with updated zoning principles designed to enforce stricter regulations on buildings and promote the safety and wellbeing of inhabitants. The middle of the decade saw a building boom that lasted a few years, and the implementation of technology like air conditioning became more common. Accompanying the completion of the World Trade Center was a devastated economy. The city of New York barely avoided bankruptcy. In the latter half of the decade, condominium and townhouse complexes surged in number, with more residential construction being conducted in the northern parts of the county. Because of the economy, many rental buildings during this decade were transformed into co-op apartments, leading to what is sometimes known as the conversion boom. Landlords were strapped for money, and they knew that there were more ways to profit off a co-op than an apartment. This decade began in recession. New York leadership adopted Philip Zimbardo’s broken windows theory which was intended to improve the living conditions of the city and reduce crime in certain areas; this initiative led to positive effects for the future housing market. The loft market became more profitable, especially in the downtown areas. The construction of luxury condos also became popular endeavors. Interest rates plummeted early on in the decade, which led to a period of investment and development. Capped by the economic downfall in 2008 but quick to restart, there was a credit boom that greatly influenced the city’s growth. Overall, real estate prices have risen dramatically over the past hundred years. The market has been forced to change and recover from economic downfalls. Observing the patterns of fluctuation, as well as the correlation between demand and supply, can help those in the real estate industry anticipate and account for future issues and opportunities.